Last week I hit a wall. I know, it's pretty early for that, considering we’re less than three weeks into the new year. But I hit it anyway. For the past eight months, maybe longer, I’ve barely squeezed my workouts in. 20 minutes here. 30 minutes there. Very little warm up, no rhyme or reason to the exercises I choose. Just trying to get something in. And something is better than nothing, right? When I'm missing my workouts, that's when I know my life is out of balance. Because the one thing I find most restorative in my life is training on a consistent basis. The lack of balance in my life was brought to light last week when my therapist handed me a worksheet with a list of standard questions: How much time do you spend tending to the needs of others, professionally or with family and friends? How much time do you dedicate to taking care of “you” and what does that look like? Do you do activities that are restoring - what other activities do you do that restore you? What activities give you energy? What activities take your energy? My therapist then handed me a sketch pad, and asked me to sketch out the answers. I laughed, but she was serious. The thing is, I see her on Fridays and usually by the time I walk through her door I’m so smoked from the first four days of the week that I can barely concentrate on conversation with her. 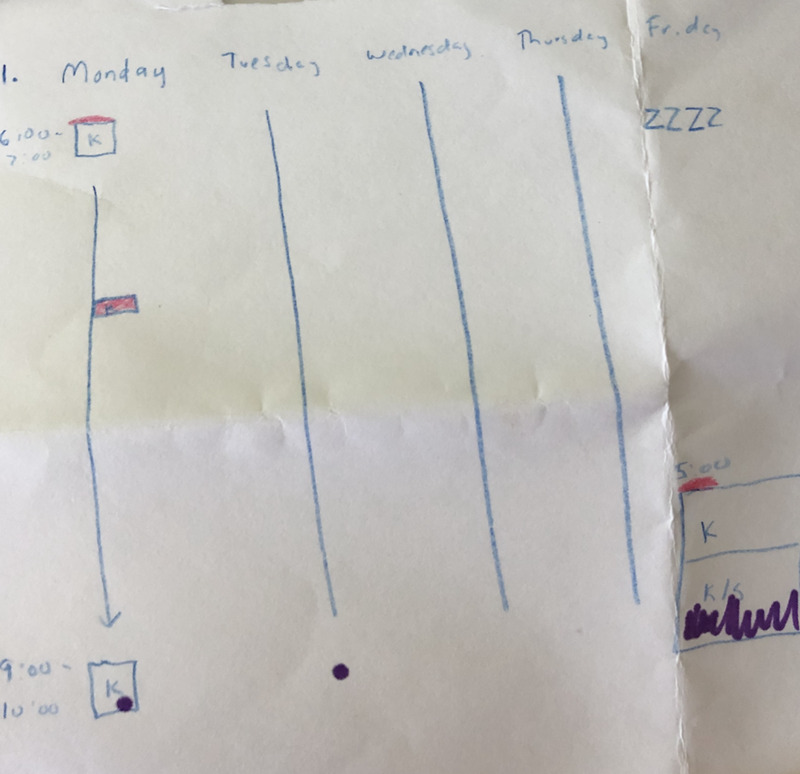 So I sketched out my week - and this is what it looked like. The red is time I spend doing something restorative - the purple is any time I spend with Sheila. And the rest is everyone and everything else. My weekends are a bit better of course, but this is the time I spend growing my business and writing - which are both things I enjoy - but they aren’t always very restorative. I’ve known for awhile that I pack my weeks pretty full. But I don’t think I realized just how full I’ve been packing them. Well, I've come to my calling in life a bit later than some. I didn't walk into my twenties and thirties doing the work I loved. I walked into both of those decades blind, trying to feel my way towards my purpose. So while I'm 42 years old, I have some catching up to do in the fitness industry, and so I'm still trying to pay the dues I should have paid at 25. You could say I focus on other people’s problems because I’m trying to avoid working on my own. But I don’t think that’s the entire story either. I genuinely want to help people, and I meet with my therapist because I'm genuinely trying to figure some things out for myself. I think a larger part of the story, the one that's harder to tell, is the layer of self-loathing I have for myself. I try to help and support as many people as I can because that’s the only way I can feel worthy. Of what, I don’t exactly know. Love, time to myself, success - I'm sure the list goes on and on. I don't write this because I want anyone to write back and tell me I'm worthy - please save your words. I write this because I know that many of us feel unworthy - of love or acceptance or self care or a balanced life. We put ourselves last yes, because we care that much, but also because we feel that we deserve so little. I don’t believe the line that we need to care for ourselves so that we can better care for others. We care for ourselves because we are worthy. I know, that’s just one big dung heap of a mess to get into on a Sunday morning, isn’t it? Sheila calls these my existential crises, which she is privy to more than most. But on the other end of this existential crisis was a pledge I'm making to myself, that I put in an Instagram video last week. That I've put myself last for the last time. I've asked several folks to hold me accountable to this pledge, and I had one person text me a reminder on Friday. My pledge is to train at least three hours in the next week. Training for me means that I have a program (thanks Josh Williams Fitness) to follow, and that I'll dedicate those three hours to restoring my body. What is your pledge to yourself? And who can you ask to hold you accountable.